EYEGAZE SYSTEM is AN Eyetracking communications system which allows control of a PC on behalf of persons suffering from movement impairment. It consists of a PC connected to a system of visual analysis that can generate speech, environmental control (lights and appliances), typing, and running of both mouse- and keyboard-controlled applications on the Edge screen. The eye can actually be used as a mouse emulator for accessing all functions of Windows. The unique system is produced by LC Technologies, an American company that developed this specific technology for the first time way back in 1988. The EYEGAZE SYSTEM is the only Eyetracking communications system equipped with a setting in which a series or filters are automatically activated during processing of the system itself. These special filters address specific problems of inadequate vision in patients which could impair proper performance of the EYEGAZE. The EYEGAZE System has corneal refraction compensation logic to minimize gaze point calculation errors resulting from varying pupil diameter. The Edge Analysis System is robust and extremely easy to calibrate. RMS tracking errors are typically 0.63 cm or less and the advanced image processing algorithms in the System explicitly accommodate several common sources of gaze point tracking error. Users diagnosed with Mydriasis or miosis (dilation or constriction of the pupil) can activate a special filter on the software panel which allows constant gauging of the center of the pupil during use of the EYEGAZE. A similar filter may be activated also for users diagnosed with Ptosis; this causes automatic re-processing and offset of the center of the patient’s pupil without having to execute a new calibration. When faced with users diagnosed with nystagmus, we suggest adjusting set time frame which defines selection of icons or of letters. While most other eye trackers using several LED infrared light emitting diodes, cause the patient problems concerning operation of the apparatus due to dehydration of the pupil, the EYEGAZE uses only one single LED and is approved by the FDA or “Food and Drugs Administration” ; EYEGAZE also respects security test criteria of the USA DEPT. OF HEALTH concerning IR illuminators. provides translating this into active onscreen eyetracking (GAZE). All functions may be activated by simply glancing at the desired object or icon for a set time period (a second or fractions of). A 15 second calibration procedure is required to set up the system for a particular user prior to use. pupil movement and actual visual range or scope of the user. There is no need to recalibrate if the user moves away from the Eyegaze and returns later. The EYEGAZE SYSTEM consents vision controlled on screen typing. By simply glancing at the desired letters of the on screen virtual keyboard for a fraction of a second or less, the user will compose words; this same word composition may also be vocalized by the EYEGAZE. To suit specific needs, several different kinds of keyboards are available. All keyboards are equipped with a “pause” key so that user may take a rest at any time, without having to worry about turning the system “off” and back “on”. All alphabetical letters glimpsed at will materialize in the phrase bar on the upper part of the monitor. Said phrase(s) may be saved or sent to other applications. In order to facilitate and quicken communication, the Eyegaze is equipped with a system of grids which can be edited and which can store complete phrases. In this way the user can have the system memorize the phrases or words he/she most frequently uses. Glancing at the grid cell will cause the memorized phrase to be pronounced vocally by the system. The EYEGAZE can ultimately also be used as an AAC device. A popular software, “The grid II”, can be used with the Eyegaze; symbol(s) / cell(s) glimpsed at will produce a vocal output on behalf of the system. By adding the “Control Prog” remote control unit to the Eyegaze the user can control household appliances in the room and such by means of IR’s. The EYEGAZE SYSTEM can be used to completely control the windows operating system simply by emulating mouse movement. Eyegaze can be customized and used to control both the Eyemouse and a 2nd PC. These two different features can easily function and coexist on the Eyegaze. EYEMOUSE – Controlling Windows from the EYEGAZE SYSTEM Pc. You can control the windows operating system of the Pc on which the Eyegaze system is installed. The Eyemouse software converts all eye movements into mouse movements; grid icons shall be chosen simply by glancing at them. Left click, right click, double click and drag-drop functions may all be easily activated. The Eyegaze must be connected to a 2nd Pc. The Pc monitors are then placed side by side. The Eyegaze controls cursor functions and mouse functions by means of a simple graphic interface located on the sides of one of the monitors. Commands given on the Eyegaze system monitor are activated and visualized on the correspondent Pc. This way one PC may be directly controlled by eye movement while further commands in windows operating system may be given by using a virtual keyboard on the other Pc/monitor. These two ways of controlling both cursor and mouse functions may be used simultaneously with no problem at all by simply complying to set time periods during which the icons on the graphic interface located on sides of monitor must be glanced at ! Practically: in order to open an application, user must simply activate the double click mouse function by glancing at the upper corner of the monitor for a specific time period (both auditory and visual feedback is given to confirm) and then user must glance at the icon which opens application. Eyegaze can be used as a control interface of a 2nd Pc. This application is much appreciated by those users who wish to continue using a Pc without having to drastically change their habits or way of doing it! 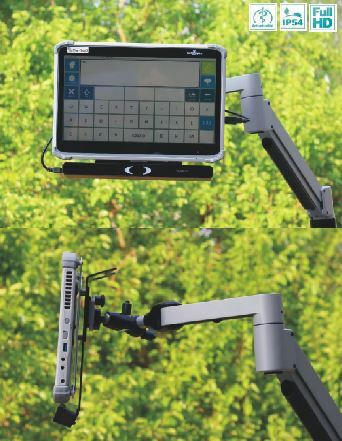 The Eyegaze must be connected to a 2nd Pc; by placing the two monitors side by side, the Eyegaze is used for cursor and mouse control by means of a simple graphic interface. Commands on the Eyegaze system monitor are activated on the connected Pc and visualized on the monitor. These two ways of controlling both cursor and mouse functions may be used simultaneously with no problem at all!